Our team consists of Mary Abajian, Kari Robinson, Charley Cooper and Melissa McNeal. Mary is the owner of Showhomes and a certified stager. Kari is a professional interior painter and furniture refinisher, as well as an experienced stager. Charley holds a degree in interior design and has extensive experience in design and construction. Melissa also holds a degree in interior design and is in charge of business development and our Update Services. Melissa is an expert at helping sellers get the highest sales price by updating flooring, countertops, paint and more. We are dedicated to bringing you unparalleled expertise, professionalism, responsiveness and results. Contact us today and let's give you the key to creating an emotional connection with a potential buyer. Boise Showhomes has received the following awards and certifications. Leaving a house unoccupied for staging may mean you won't notice when the pipe breaks in the winter or animals start infesting it. You can't control vandals without a watchful eye within the property. That can make you lose a top dollar on the property's sale. Showhomes however offers you a Home Staging Manager to keep your vacant house in Boise in pristine, magazine-worthy showing condition. Our home staging managers create the desire to live in your property by ensuring that potential buyers who tour it see the property as a home rather than an empty house. A Showhomes Home Manager is a person or family with elegant home furnishings who lives in a vacant home for sale. The home staging manager keeps the home clean and lets realtors show it featuring the beautiful furniture, artwork and accessories. In exchange, the Home Managers get dramatically reduced monthly fees, far below the market rate. Showhomes home staging manager services in Boise provides you with a live-in professional caretaker who cares for your home keeping it in show-to-sell condition. We give you the peace of mind that your home is not just safe but ready to reap the top dollar. Showhomes we are keen to provide customized home staging solutions tailored to each home in Boise. Our home staging options include design and decorating by the best of Boise staging professionals, including whole house staging as well as partial home staging. As America's leader in home staging, Showhomes provides a full range of professional home staging services in Boise. Home staging in Boise is the most effective way to sell properties in your local real estate market, and we have a proven method to stage and market your home for sale. With over 25 years of experience and a coast to coast network, the Showhomes network has helped sell over 25,000 homes with a valuation of more than $8 billion. We're proud to have partnered with many local and national real estate brands such as Keller Williams, Coldwell Banker, Prudential, Re/Max, Century 21 and more. Competition is the primary reason why you need to stage your home for effective sale. Nine out of ten buyers today preview and find their homes online. Unless you utilize a method that puts your property above the fold, it may be hard for buyers to find you. How you carry out your presentation will make all the difference. Whether or not to stage your home for sale is no longer an option; home staging is now a must in today's real estate market. Buyers have lots of choices when it comes to buying a residential or commercial property. To be successful, therefore, you must aim to make your home staging the most beautiful among your range of competitors. Why get a home makeover in Boise? Well, an impeccable look will inherently give your property a competitive advantage over its competitors. Most buyers are naturally drawn to visually appealing homes when making their property buying decisions. A little makeover of your home before staging it for sale will make it sell faster compared to other homes within the same range. If you are selling your home in Boise and need help making it look perfect for showings, Showhomes can help. With our full range of home makeovers in Boise, we create that "model home" out of your property that you'll be proud to present to your potential buyers at top dollar. Showhomes home makeovers in Boise help create the look that captures premium buyers and sells faster and at higher prices. If you're looking for some design ideas for your current home or have a home for sale that needs some makeover magic, we can help. Staging your home by a professional stager is the most cost effective way to refresh your home. Our home makeovers cut across furniture placement, decorating trends, color choices, home improvement and more. We have a popular track record across the US for our success in staging vacant homes; we also help sellers in Boise with owner-occupied homes. Whether it's a new home or property that's up for sale in the market, we can provide the much-needed makeover to help drive desire among buyers to own the property. We can re-design and re-purpose your existing furniture and decor for an occupied home, and using your furnishings, we can create a "model home" look that buyers will irresistibly respond to. Home makeovers enhance the presentation of your home and make it more appealing and more competitive in the marketplace. Such a remodeled property captures a faster sale at a premium price. Most buyers in Boise are looking for homes that are ready for occupancy and not ones that still require them to make a few upgrades before they can settle in. Yet no property owner wants to spend cash on the home they are preparing to sell. Conversely, making your home move-in-ready through a few changes can provide the greatest return on investment when selling the home. Showhomes can help you out with that part. Our home updating services in Boise are exclusively designed to make homes appealing to the broadest base of buyers. In effect, Showhomes home updating helps increase the value of your property through these important changes that go beyond basic de-cluttering and cleaning. Buyers find fresh paint and flooring truly appealing. With a Showhomes update, we can provide the right changes with our Exclusive Color Palettes comprised of on-trend neutrals that will not distract attention from the outstanding features of your home. We are in touch with the latest industry realities and know precisely what will create mass appeal. Your favorite shade of purple or gold may be a serious turnoff to a potential buyer. So the input of your Showhomes home updating professional will be a highly valuable service when considering consumer appeal. We help you select the perfect palette for the look and feel that will place your Boise home above the competition of similar homes in town. A time-worn carpet will not only mask the beauty of your immaculate floors, but will also mask your only chance to reap an extra dollar from your property sale. Dated or worn carpeting is the number one turn-off for home buyers. It may even cause a potential buyer to check the property off their list of potential homes altogether. MULTIPLE OFFERS AT THE FIRST OPEN HOUSE! This luxurious home needed the right furnishings to show off the fabulous architecture and finishes. We staged on Thursday and Friday, and three offers came in during the open house on Saturday. Realtor David Andrews wisely chose to stage, and his clients enjoyed the benefits! NORTH END BUNGALOW SOLD IN DAYS! We loved making this 600 square foot bungalow look cozy and warm, but very livable. It sold during the first open house, and the lucky buyers will enjoy a fabulous location and green construction. Realtor Tony Esquivel knows how to get things done! This beautiful, spacious family home had been on the market a long while before staging, but when realtor Kent Proesch got the listing, he immediately hired Showhomes to stage the home - and he had it sold within two months. Kent had worked with us before and like all the BEST realtors, knew the investment in staging was in his client's best interests. BEAUTIFUL VIEWS HIGHLIGHTED BY BEAUTIFUL STAGING SOLD THIS CONDO FAST! This older condo sold within weeks after realtor Tony Esquivel updated the interior and had Showhomes add furniture and decor that would highlight the fantastic river views. Tony's clients always benefit from his experience and insight into what will get them the best price! PARADE HOME SOLD WITHIN THREE WEEKS OF LISTING! This gorgeous home built by Sherburne-Marrs, one of Boise's top prestige builders, sold within three weeks of staging. Showhomes helped buyers realize the livability of the interior spaces and, just as importantly, placed outdoor furniture to focus attention on the lake, private dock, and four separate outdoor-living areas. What a lucky buyer! This large family home just needed the right furniture and decor to show buyers how the very large formal living room could be transformed into an inviting gathering place. After being listed for three months, the homeowner accepted an offer within the first 30 days after staging. This home needed staging to illustrate the versatility of the unusual floor plan. Using green as our accent color in the main living room connected the indoor space with views of the back yard. This home received multiple offers within three weeks of staging, after being listed for over four months. This home's unique and open floor plan needed staging to help buyers envision the way they would use the space. We used rugs, color, and beautiful on-trend furniture to help it sell within 30 days after staging - after being on the market for over five months. House looks wonderful. I can’t wait to have buyers see it. Mary is one of the best and she knows how to take care of her clients. It's not just about staging...it's about communicating with people. She goes out of her way to make sure her clients are happy and the staging is to everyone's liking! Mary was extremely professional and accommodating of our specific needs. She was attentive, proactive, and was after our best interest. I would recommend using Mary and Showhomes Boise in the future. Your detailed reports to home owners that you prepare for the staging consultations. "Thank you for taking time out of your day to come and consult with me on the decor of this house. Your time and input was so valuable to me and really helped me with the sellers . . .You are one of a kind. I will definitely refer other agents to you. " ​You did a wonderful job. We are having amazing feedback and lots of positive comments regarding the staging. Thank you for your efforts to make these homes look beautiful. Staging that larger floor plan makes such a difference. Melodie Ostman, REALTOR® with Group One Sotheby's International Realty, Eagle ID	As a real estate agent, working with a reliable and professional home staging company is critical. Mary is professional, responsive, and supplies quality furnishings and accent pieces. Her attention to detail along with her gift for staging and the care she puts into everything she does puts Setting The Stage well above and beyond the competition! I have been very pleased with Mary McDougal Abajian with Showhomes of Boise and would highly recommend her to anyone requiring staging for their home! "Mary and her team were great to work with. Very responsive, professional and worked hard to complete the project on time even though there was tons of snow to deal with! They were true to their word and everything they promised, happened. Excellent Job!" "Mary was extremely responsive and flexible. Working with her on our listing with a very unique layout made the ultimate difference. The same week the home was staged, we received an offer after several months with no activity. She made a huge difference!" "SUPER helpful and attentive. The staging was spectacular and I received two offers on the home within a couple days of having the home staged by Mary. This was after eight months on the market with no offers. Could not have been any better." "[My husband] and I are so very grateful to you and will be sure to tell everyone we know who will listen to our story. We will recommend you again and again to all who ask, and even to those who don't!" This is a design of kitchen island which incorporated wheels. What this does is it makes it very portable and handy in that it can be moved to just about anywhere it needs to be used. The downside to this style is that a sink or any other kind of appliances cannot be installed in it - because it does not have a permanent location in the kitchen. As a space saver it is an excellent choice. This is a personalized island that makes home staging in Boise much easier in the kitchen. The customization comes from how you intend to use it and what you need to be contained in it for best results. This also means it can be designed to match the existing counter/cupboard style and colors. While this is probably one of the most functional island styles, provided you have designed it properly for your specific needs, it is also the most expensive. This is a design that will be larger in size because it can do so much more for you in the kitchen. Think of it as an "all-in-one" item which gives you counter space, storage, somewhere for an oven, a breakfast counter, drawers for utensils and so much more. The drawback is the size as it will be something that will sit in the center of the kitchen and force all traffic to move around it, but it scores big on functionality. The kitchen is one of the most valuable rooms in your home as it is not only for food preparation but it is also a gathering place. Home staging in Boise puts a lot of emphasis on the value of a great kitchen space and islands enhance this adding value to your property. For additional advice on the right kind of kitchen island that will work best in your home, contact the professionals at ShowHomes in Boise today. 1 - Focal Point or Not? If you are trying to make the rug stand out in a room, the most effective way to do this is with color and design. A bright color or a dynamic print will draw eyes to the rug once anyone enters the room. Conversely, neutral colors may just blend into a room so it is crucial to seek something with a great deal of splash and vibrancy. One home staging in Boise mistake made with rug use is to not properly measure. This means making sure the rug selected does not overpower a room or setting in a room. An example is if a rug is being used under a piece of furniture, you will want it to be as long and wide as the item sitting on it. When selecting a rug for a room you will want to keep the color scheme of the space it will be used connected to the rug. In other words, when home staging in Boise, the shade should match or contrast well with the existing colors. Floor, wall and ceiling colors need to be considered heavily to prevent drastic clashes. One great option for using rugs in a room has nothing to do with the floor. 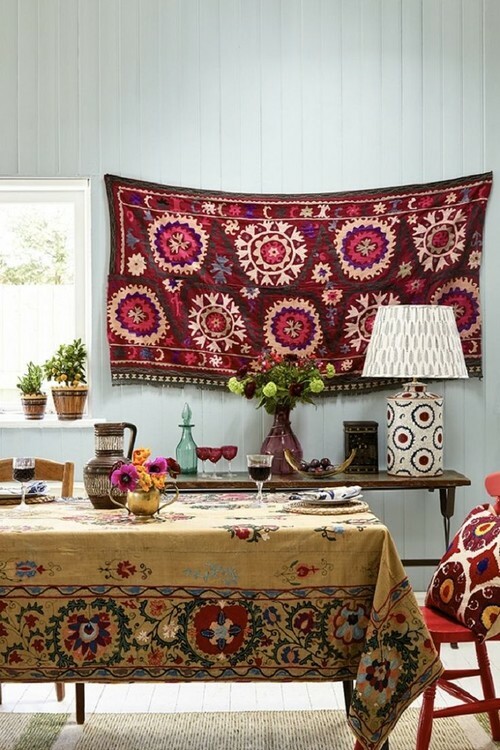 In fact, if you are happy with how the floor looks but need something special in the room, hang one or more rugs on the wall. Patterns and shades will come into play with this plan and can add warmth and depth to any room. For assistance with all your home staging in Boise ideas, contact Showhomes. They can provide you with the home decor tips you need to have your home staged in such a way that you will see results when you put it on the real estate market. Give the home staging professionals at Showhomes in Boise a call today. With proper staging of the living room you stand a better chance of receiving a strong offer on your home or condo. Here's why: the living room is typically intended for family use. It is designed as a gathering place and a social center of any home. The living room contains all the elements you and your family require for 'living' your specific lifestyle. Working in much the same way in which a new paint job gives the exterior of a home a fresh look, so will new flooring in the living room. When it comes to home staging, potential buyers tend to look favorably to new flooring. It will transform the room making it easier to imagine as the entertaining center of the home or a quiet place to relax. If new flooring is not within your budget, there are ways to add pizzazz to the current floor coverings. For existing wood a good sanding job can give it a new look. For floors covered in carpet, remove the carpet to reveal the wood underneath. If the floor is covered in a vinyl treatment, give it a powerful cleaning and scrubbing to make it look new. Nothing makes a room more inviting than the small things and home staging the living room is no different. As this room will be the one most home buyers will either see first or spend more time in, it is essential to make it inviting. This can be achieved by placing freshly cut flowers on display, possibly even a selection of baked goodies. The goal here is to add the scents of home without going overboard. This means, do not spray the room with too much air freshener and refrain from too many scented candles. By keeping it warm and friendly, with the proper combination of "home scents" potential buyers should feel some kind of connection to the property just by stepping into the living room. A living room is a space in a home where a family's personality is revealed. When home staging in Boise that personality has to be removed in order to give potential buyers a neutral site to imagine with their personal touches. This means all of those family treasures need to be taken out of sight to not affect the message the room will send to others. This means that family photos, mementoes, books, magazines, CDs and DVDs have to be stored away. 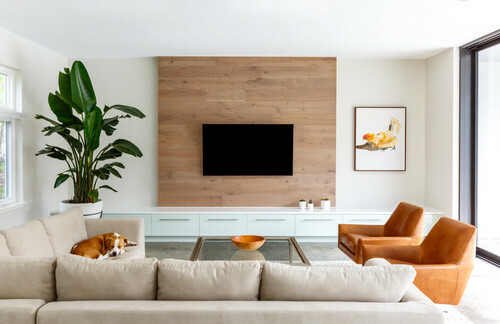 While these items say a lot about you and your family, it will create a hurdle for some home buyers trying to plan in their minds what their personal effects will look like in the same space. Besides, someone admiring your reading material is no longer admiring your home. With living room staging one of the most important things to keep in mind is how things are to scale. This can mean that if the furniture is too big it may make the room appear small or may even block visual features. Other times there may be too much furniture which would make the living room appear crowded or cramped. As you are trying to create a relaxed area of the home for family to meet and unwind, less is much more in this case. Even new furniture can do a lot with what the overall living room looks like. You don't even have to spend a lot to reach this goal. All the furniture needs to do is look new, contemporary and appear expensive in order to be successfully staged. The living room should project a welcoming atmosphere for potential buyers and all it takes is a little bit of work to increase the attractiveness of your home. If the staging of the living room is done correctly, it will give off enough personality to be worth a look. It will also leave enough to the imagination, which is what the professionals at Showhomes will help you achieve. The main function of a living room has changed in recent years which sometimes makes home staging in Boise a challenge. The room that was once used primarily as a place to welcome and entertain guests has morphed into a multi-purpose space that is often the focal point of an entire home. This has increased the challenge when it comes time to add furniture and accessories to the living room. When home staging in Boise, and in particular the living room, it is often best to start with a completely empty space. This not only assists in identifying the focal point, it gives you a chance to possibly add more than one in a living room. For example, a bare living room with a large fireplace will naturally see this feature used as a focal point. Add a large flat screen television on another wall and you now have two focal points. The idea of a focal point is to have something in a space that catches the eye. It doesn't always have to be a large feature, either. When home staging in Boise focal points in a living room can come from a simple set of framed (or unframed) prints on a wall with task lighting. A hand-painted mural that fills a wall from floor to ceiling or a large sofa situated in front of a view window can also serve the same purpose. When choosing a focal point, ensure that the visual impact of it is enhanced by companion pieces that 'frame' the setting. An example would be a large piece of seating furniture facing a fireplace. The fireplace would be the focal point and smaller furnishings such as loveseats and coffee tables, would be used around the larger sofa. Spacing away from the sofa and providing a pair of entry/exit points (one per side) creates a place for traffic to flow. Lighting is also a key element in helping establish the focal point of a living room. Yellow is the best color choice and pendant lighting works magic on setting the right mood for the space. 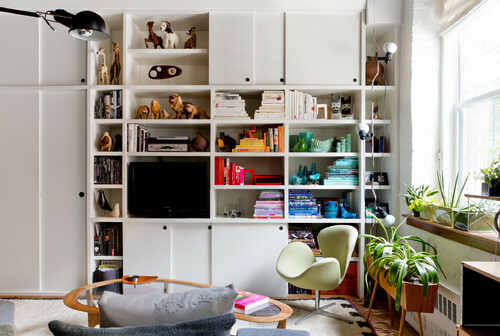 As living rooms are now multi-purpose rooms, remember to stay away from cluttering it up with too many furnishings. 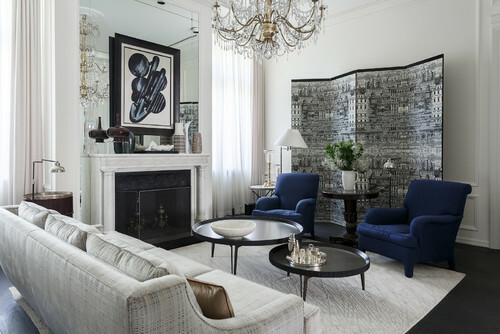 In this case, the adage of less is more could not be more appropriate in developing a strong focal point in any living room. For assistance with all your home staging in Boise ideas, contact ShowHomes. They can provide you with the advice you need to have your home staged in such a way that you will see results when you put it on the real estate market. Contact the home staging professionals at ShowHomes in Boise today. Home staging in Boise often takes a hint from the corporate world. For example, with large companies shifting their office settings to more comfortable designs, trends have emerged. Some of the trends that have shown productivity levels and employee satisfaction increases are a good place to pull ideas for setting up the kind of desk to use in your home office. This is essentially a multi surface apparatus that sits on top of an existing desktop. It is designed to hold a computer screen and keyboard on two different levels and the entire piece can move up or down to accommodate work while seated and work while standing. This is a great option for those who prefer to avoid sitting all day at a desk. You can start your day seated, work through part of the day standing and finish your work day seated again. It will keep you refreshed and productive! This is a variation of the first option only in a completely adjustable desk. They come in electronic or manual adjustment styles and depending on your work style, you may find one better than the other. The same benefits come from this as are available from the sit-to-stand desktop - you can add the variation of standing to you work day and still be productive instead of having to work in just a seated position. If your home office in Boise is used for large meetings, this option may be perfect for presentations or shared work space. We can probably thank the fitness craze for this option. Believe it or not, there are desks designed with a treadmill incorporated into the operation. Home staging in Boise means that while you will very likely not burn off a lot of calories working on a project, the treadmill ensures you will burn some while staying active and moving your body. Blood circulation is a good thing to keep you healthy and stimulating the brain so possibly this is the choice for anyone needing a creative boost. The home office is a place where you can generate extra income, save some expenses from having a storefront location and still work in the comfort of your home. At Showhomes in Boise we can help you with the home staging of your home office which will increase the value of your property before putting it on the market. For home staging in Boise advice, contact Showhomes today. Home staging in Boise also extends to the exterior of your home. When it comes to an overall visual impact of your property, the way your lawn and garden looks says a lot about you. If you are looking to leave a good first impression, these tips will help you to achieve that goal with just a little extra effort on your part. Brighten up your yard and garden with the use of planting containers. These come in various sizes and colors giving you many options to bring dynamic looks to wherever you choose to use them. Glazed ceramic planting pots are a common choice for this. You can spread the colorful visual that comes from perennials by splitting them up in the spring. As they increase in size over time, dividing them into several planting locations will pay dividends later once they grow and look fuller. The best advice for home staging your Boise garden is to keep an eye on the health of your flowers and plants. Disease can come in many forms and is not always the result of a pest infestation. As soon as you see any sign of damage you must take action. When you mow your lawn continue to raise the cutting height as weather gets warmer. Moisture will remain trapped in taller grass for longer and weed growth is reduced with a higher cutting height. Patchy areas should be reseeded to encourage growth. Give the area a vigorous raking to remove debris and loosen the ground. Remember to water the reseeded area more than the rest of the lawn for the first month to encourage germination. Watering the lawn takes some science in that young plant life only requires light but frequent watering. This promotes budding. Mature plants are capable of soaking up water that is deeper in soil so longer watering helps this. When home staging in Boise the lawn and garden are as important as the rest of the home. A neatly manicured lawn and flower garden not only creates a place you will want to spend time to relax, they also add value to your home. For more advice on how to properly stage your lawn or garden prior to listing your property for sale, contact Showhomes. Let our professionals assist you with this important task. Call Showhomes in Boise today for more information. Trends come and go but when it comes to bedroom colors in Boise you can always count on one thing – there is not going to be anything dull or boring. Bedrooms are not just for sleeping as many have evolved into spaces used for relaxing after a long day. That is why many larger bedrooms feature a television, task lighting for reading or even a corner for a computer or crafts. It is because of these trends that color continues to make an impact. There is still a lot of style that comes from a neutral foundation bedroom color in Boise. This includes creams, whites, metallics, taupes and grays. With the foundation color acting as a frame, you can add almost any other color to create a bold but consistent statement. Grey is the multipurpose neutral as it will go with any other color so it can assist in creating a dynamic mood to your bedroom. Pastels lend an air of peace and calmness to any room. If you intend to have your Boise bedroom primarily as a relaxing place to unwind and chill, then your best bet is to rely on a number of subdued pastel colors. Some great options include dusty blue, seafoam green and lavender. Pastels are nothing more than ‘lightened’ versions of colors but those, along with muted hues which contain a grey pigment, produce peaceful and quiet environments. On the completely other end of the spectrum is bright colors including orange and yellow. They prove to be very effective if you want to jump out of bed first thing in the morning and feel excitement running through your veins. That extra kick start you can get from bright and bold colors cannot be ignored as they will send you on your way with a blast of energy that does not come from soft and subdued colors. Another polar opposite to bright and bold is the deep and dark richness that comes from shades that are anything but pastel. The great thing about using dark shades on a wall is that is does the opposite of what you may think. If you think a dark bedroom will appear small, think again. Dark colors will actually recede which creates the illusion that the walls are further away than they are. Provide a bright contrast to that such as a white trim and watch the room explode. One more trend for bedroom colors in Boise comes from the classy appeal and visual that comes from layering colors on a foundation of whites, grays, gold and ivory. The texture look brings a touch of elegance along with glamour to the room treated with this method. When you are faced with deciding which direction to go with the new look to your bedroom, give us a call for some advice. Showhomes in Boise can give you assistance using our years of experience and professional knowledge so that the bedroom you want is only a phone call away. Home staging in Boise with pool and spa ideas can make your house a welcome retreat following a long day in the office. There is nothing more relaxing after a hard day of work than dipping into a pool or spa to wash away stress. Here are some of our favorite ideas to get you inspired when creating that place to escape within your home. For a pool located in a large yard lighting will be a required element. One creative way to incorporate this and still give the pool some character is to have lighting fixtures that are sunken into the concrete pad that surrounds the pool. Add a neutral color stain to the concrete pad, place decorative boulders or shrubs in curves cut out of the concrete pad and you have created a transitional setting from yard to pool and vice versa. With a hot tub sitting in a small space, home staging in Boise would call for screening or some kind of privacy wall to try to ‘hide’ nearby neighbors. In small yards and high density neighborhoods your best bet is to create the space that is personalized and private. Using a wide deck around the spa can create bench seating reducing space and having a concrete pad extending from the home brings everything in closer making an intimate getaway on the other side of your neighbor’s fence. If your property allows the space required for both a pool and spa, consider putting them in completely different spaces. A stone wall can be the back border to a pool with a fountain at each to create vertical visuals and stone pavers can connect the spa to the pool as well as provide a unique deck around both. Low elevation shrubs and plants can be used to wrap around the pavers to add a smooth transition from yard to pool, spa or entrance to the home. When home staging in Boise and your property happens to have a view, here is where you can make dramatic use of your surroundings with a pool or spa. The view can become the backdrop to your pool as you use pavers on the three sides that do not face the backdrop. Place benches, plants and all other accents in such a manner that the view is what everyone will see regardless of where they sit or stand. A short-metal railing can be used as the pool’s back border which can then be hidden by climbing and clinging plants to keep the view clean and natural. Sinking a spa into the center of a wooden deck makes great use of limited space. When home staging in Boise a deck with a spa in it brings a great deal of character into the picture. With the top of the spa level with the deck you can just step inside. Wrapping the spa with non-slip indoor/outdoor carpeting makes it safe. The deck railing also becomes a privacy screen and deck seating becomes a place to visit around the spa or to dry off on a sunny day. For any of your indoor or outdoor home staging needs in Boise contact ShowHomes. We can give you the benefit of our years of expert design with advice to give your home, yard and entire property the look you are after before you list it in the real estate market. When home staging in Boise do not forget to concentrate on the kitchen. There are so many stylish choices available that you can’t go wrong with making the flooring in your kitchen a key element in preparing your home to sell. Next to a living room, the kitchen is the heart of any home as that is where the family gathers at least once a day for a meal. Or it may only get together to prepare a meal. Either way, a lot of family bonding takes place in a kitchen and because of the steady flow of traffic you will want to ensure that the floor can handle it and still remain relatively easy to keep clean. Here are our top five choices for kitchen flooring in your Boise home staging program. This is the most popular choice for kitchen flooring in Boise for a number of reasons. In addition to being durable enough to last a very long time, hardwood has a dynamic visual effect. If you are looking for natural colors you cannot miss with hardwood as it typically features grain patterns that are detailed and are enhanced by the natural tones that accompany it. The affordability of an expensive look is what you can expect with laminate. When home staging in Boise you will want to consider the real wood or stone patterns that are available with this kind of flooring. It also means that color choices are many which can be a plus when you add that to the low maintenance, long lasting qualities of laminate. This is probably the easiest to work with if you plan to install it yourself. Vinyl tile is also one of the most versatile as it comes in many different styles and patterns that allow you to completely customize your kitchen flooring in Boise project. It lasts a long time and resists tears and rips plus, it is as easy to maintain. This is sheeting made of vinyl where prints have been applied to the surface creating any kind of texture or look imaginable. This covers a full selection of choices including stone, wood and whatever else can be printed into the material. It is also a durable kitchen flooring choice in Boise, has stain protection and is quick and easy to keep clean. A higher end product for home staging in Boise comes from luxury vinyl. Again, the material carries various prints on the surface that can be anything from wood to ceramic to stone and all other possibilities. The difference here is that the product is soft and feels warm and comfortable. However, as it is vinyl it is low maintenance and durable. The perfect kitchen flooring still has to match with other elements within your home. This includes the overall theme of the room and the style and color of accessories and features. It should go well with the look and color of the appliances, cabinetry, the countertops and lighting. The kitchen flooring in Boise choice you make should also fit in with your lifestyle, the amount you use the kitchen and most importantly, cost within your budget. Sometimes it’s best to consult with an expert who can not only give you great advice but help you figure out what works best with your home. For a helping hand with home staging in Boise, contact Showhomes. In Boise, your home office style should reflect a personality that is fitting with the kind of work you intend to use it for. This means having to do a little bit of pre-planning prior to actually setting up your home work space. If, for example, you’ve been using the kitchen table or have outgrown the corner in the den, it is time to rethink your home office. 1 – Where Should It Be? Before you pick a location in your Boise home for your home office, you need to consider what your business is. If you are manufacturing a product on-site you will need space that may require more square footage than the spare bedroom. The same goes for a home office styling related to an online business where you may not need as much space. You will also want to look at whether or not the home office space will be used to entertain clients and customers. You may need it for company meetings or social gatherings. Then again, if all you need is room for your desk, computer, a lamp and a chair plus some filing cabinets, now is the time to make those decisions. 2 – What Kind of Layout Will You Need? Assuming you will require more than a small corner of a room for your Boise home office, you will need to look at the location with a few things in mind. Will you need room for production? Will you need space for meeting customers/clients? Do you need space for packing/shipping of products and do you need an area for relaxing, billing and anything else? Once you have determined these factors you will be able to put together a plan on what kind of furniture you will need and so on. One important factor to include as part of the layout of your home office is the location of all your electronics. Printers, scanners, computers and internet connectivity needs to be planned long before you move into the space. 3 – Do You Know About Color Psychology? If you intend to spend a lot of time in your home work space you may want to put some thought into the color scheme you intend to use. Color will have a lot to do with the mood of the space and have an effect on your overall job performance. This is why you will want to have motivational colors on the walls, ceiling and tied into furniture, carpeting and wherever else you may need some color influence to keep you going. The best colors for this include blue (productivity) and green (energy). On the off hand chance that your work is physical, tedious or you are going to put in long hours at your computer desk, orange and red are also energizing colors. Yellow is another good choice if you are creative as it stimulates those creative juices. The downside to yellow is that it may cause eye strain. 4 – Where Are You Going To Store That? One of the key elements to your home office styling in Boise is going to be storage. Depending on the amount of space you have to start with you may require a lot of storage. Great ways to incorporate this with the style of your home office is by using furnishings and accents that double as storage units. For any and all information on turning that space in your home into a functioning and effective home office in Boise, contact Showhomes today. When it comes to bathroom makeovers in Boise you will want to be well prepared. This means having a clear concept of what changes you intend to make and that you will have all the necessary materials. Depending on the scale of your bathroom renovation project, there will be some fixtures and extras you will need to order in advance so that you will have everything together when you start your bathroom staging in Boise. If the shower in your bathroom is part of the tub you will already know that size is limited. One amazing little trick that will increase the size of the shower stall without ripping out walls and rebuilding is also one of the cheapest bathroom updates you can make to your home in Boise. A curved shower rod is the magic tool that will take care of this. Sure, it will cost maybe four times as much as a straight shower rod but it will still total under $30 and it will create more space in the shower instantly. This is an interesting twist on the visual look of your shower. All you need is a handful of tiles and use them to either border or create an unusual pattern in the tile around the shower. When bathroom updating this is not only an inexpensive renovation, it results in a huge impact on the look of the shower stall. Contrasting colors, patterns or textures are all you need along with a touch of creativity to make this work. Take a look at your current light fixtures and you may want to change them when bathroom staging in Boise. With an endless selection of different types of task lighting, accent lighting and everything in-between, a trip to the hardware store lighting department can become a great adventure. Never be afraid to go off the chart on lighting because it will do everything from set the mood to keep you from cutting yourself shaving without a huge expense. Updating the lighting is one of the smarter things to do with any room renovation with bathrooms ranking near the top as showing more value with a change. This is by far the simplest and most practical of the bathroom updating in Boise tips you will find. It is all about a new paint job. It is amazing what a difference a new color, pattern or texture wall treatment can do to the look and feel of a bathroom. This is another element where stepping way out there can bring incredible results. Be sure to use contrasting trim or a color that makes the vanity jump out of the countertop because when a bathroom gets a makeover, it should be turned into a feature room in the home. Sometimes a great idea for bathroom staging looks better on paper and doesn’t seem quite as easy to do when the materials are gathered. Maybe you discovered that while you are quite capable of many do-it-yourself jobs, a bathroom renovation just isn’t within your comfort zone. That’s okay because it is never a bad idea to rely on an expert for the job. In Boise the experts who can give your bathroom the makeover it deserves are at Showhomes. Let the Showhomes crew turn your bathroom into something special! Making your home stand out when it is on the market is what Showhomes does. For home staging in Boise there are many possibilities that can create the perfect look – the look that catches the eye of the right buyer for your property. You can spend a lot of time sprucing up the interior of your home, the actual living space, but what about putting some extra attention on the exterior? Home buyers are typically first attracted to a home by what they see when they pull up to the front yard. The term used in the real estate market is ‘curb appeal’ and that simply describes the level of attractiveness your home has from the street. While it may sound like a huge project to bring your home up to a standard that causes passers-by to give it a second look, there are affordable ways to dress up the outside. If you are already taking good care of your lawn, this will be an easy one to maintain. If your lawn is trimmed and tidy, minus brown spots, it sends a signal that is has been well taken care of. It should also say that it is not a high maintenance lawn. Added features that give the lawn additional points include boulders, rocks, ornamental grasses and plants that are particularly drought tolerant. These all add to the perception that this yard is easy to maintain without a lot of cost. Home staging in Boise should include some lighting, but not too much. Being able to show what your home looks like at night with lights strategically located on paths, entrances, in tree branches and highlighting special features is good for many reasons. It gives the home a dramatic personality and also provides a sense of security with little in the way of dark corners visible. Lighting should not be comparable to Christmas decorating as it should be subtle and not overdone. There is no denying that the gentle sound of water is not only relaxing but it has a soothing effect on all of us. A water feature in the backyard such as a small fountain will add special appeal to your home and property that can only be matched by having a creek running through it. Few home buyers these days, unless they are already at retirement age, will not admit to having busy, hectic lives and the white noise, street sound blocking beauty of a water accent will earn much praise and attention. In addition to keeping a neat and tidy lawn, paying attention to seasonal colors can add a great deal of interest to the way your home looks within your neighborhood. Springtime colors will be far different than those in fall but each present many opportunities to create brilliant displays that can brighten up the look of your home. Still on the subject of lawns, colors and the plant life in and around your yard, it is very important to pay as much attention to scale as you do with color and species selection. The key is to keep in mind that trees, shrubbery and other plants and flowers are meant to be accents. The larger elements can be used to frame a feature in your yard but not take away the focus of that feature. Plus, too many trees create shade and some home buyers will view that as a lot of work come fall with leaves blanketing the ground. Never dismiss the value of tweaking up the selection of extras in your yard and property. This can include a funky old mailbox, bed frames converted into a gate, a low-level fence, decorative add-ons that don’t distract from the overall look of your home but give it a touch of character. These additions can be used throughout but should not outnumber anything else already in your yard. As you can see, home staging in Boise takes some planning and an eye for detail and color. This is not a task for the average do-it-yourselfer, especially if you are preparing your home for the real estate market. For best results it helps to consult a professional home staging company. Contact Showhomes today to discuss options that can give your property the value you desire when it is time to sell. Mary has been a real estate investor for many years in the Boise valley, and decided in 2015 to transition into a career combining that experience with her love of home design and decor. She is a certified stager. Let Mary help you make your home look its very best for prospective buyers so you can achieve the highest sell-price.